For in-game norndolls, see Norn Doll! 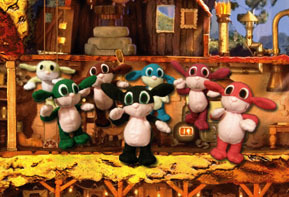 The Limited Edition version of Creatures 2 came with a small plush beanbag Norn, known as a Norndoll. The toys were available in Purple (Blueberry) for the white C2 box with purple waterfall-bridge side section (shown left) and in Green (Random) for the similar white C2 box with black volcano side section, as well as in Brown (Berry) for the special Creatures 1 tall white box. These beanie Norns were possibly commissioned due to pressure from the Norn Doll Wanters A Lotters action group on alt.games.creatures. 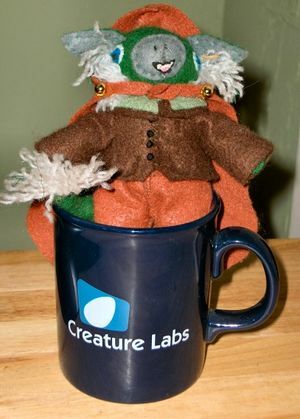 A prototype Grendeldoll was also developed, but didn't make it to the shelves and remained in the Creature Labs offices for many years. It is pictured in the lower image on the right (with a paintbrush for hair). 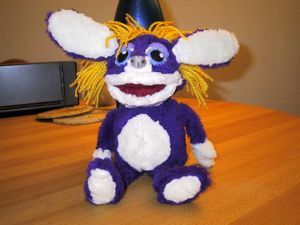 Creature Labs also had a purple medium sized and green large sized plush Norn, (shown in the webcam photos below). Despite being asked several times, Mindscape never developed further models of Norndolls to be given away or sold as merchandise, and the original templates were destroyed by the manufacturers a few years after they were last used (as was their process for old designs). This loss encouraged the Community to start making their own Norns. 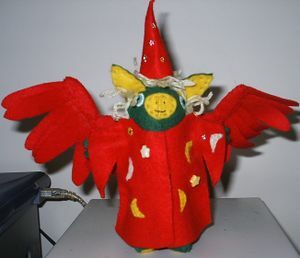 Alien, Data, Tafgana, Don, Nish and Lyz York have all been known to make handmade Norndolls, many of which have been given or sold to members of the Creatures Community.
. . . and one for GreenReaper! Creature Labs webcam photos with large green, medium purple and two small Norndolls. 1999. Add yourself if you have one! This page was last modified on 1 April 2018, at 03:08.